After the big size shock Pretty Little Liars has given in the last episode aired on August 27, it has become so difficult to wait for the next one. Ezra is A?? I personally always loved the on screen chemistry between Aria and Ezra. They are so good together. Ezra being so cool as a English teacher and showing his romantic side when Aria is around. in the past episodes, he also proved that he can be a responsible father. But, who in the world would have thought that Ezra might be A? Pretty Little Liars is a pretty little story of 4 or may be 5 girls: Aria, Spencer, Hanna , Emily and Alison. 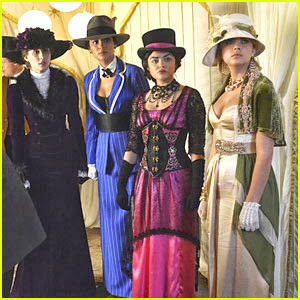 It starts when Aria returns to a fictional town of Rosewood in Pennsylvania. Before Aria left the town, all the 5 girls spent a night together when Alison went missing and has never been found. Then, all the girls keeps receiving texts from an unknown A who seems to know all the secrets of the girls which they only shared with missing friend Alison. They suspect that it is Alison who is playing with them remembering that she likes games. One day suddenly, cops find Alison's body. Although it wasn't in a state to recognize. But, they declare it as Alison's. Then the show continues with the girls suspecting other people and there will be a series of deaths and eventually they come to know that A is going to go to any extent to achieve what he or she wants(may be all he or she wants is to torture them). In season 3, it is revealed that Mona (friend of Hanna) is A. She goes to jail or some kind of rehabilitation. They live peacefully for a while and they again start receiving those malicious texts. This time A comes out even more dangerous than past. But, Mona is already in full security. Who could it be this time? Following some leads, they come to know that there is a red coat person involved in this and Alison was also followed by that person before she went missing. The show is getting so serious and in the last episode, the story went in the path of "Ezra (ex boyfriend of Aria) being portrayed as A". I wonder how it is going to turn out. I am eagerly for waiting for Tuesday to watch the next episode which would be the Halloween's special. There is already a lot of promotion going on in Facebook about the episode in Ravenswood. I cant wait for it.!! !